Captured on January 15, this narrow-angle Cassini image shows an outer portion of Saturn’s A ring on the left and the ropy F ring crossing on the right. The thin black line near the A ring’s bright edge is the Keeler Gap, a 22-mile-wide space cleared by the passage of Daphnis, a shepherd moon barely 5 miles (about 7.5 km) across. As it travels around Saturn within the gap its gravity perturbs the fine icy particles within the rings, sending up rippling waves both before and behind it — visible here near the upper center. While lacking the murky mystery of Titan’s atmosphere, Enceladus’ dramatic jets and the tortured and cratered surfaces found on Dione, Rhea, Mimas and many of Saturn’s larger icy moons, little Daphnis has always fascinated me because of the scalloped waves it kicks up within Saturn’s rings. Eventually these waves settle back down, but at their highest they can extend a mile or two above and below the ring plane! 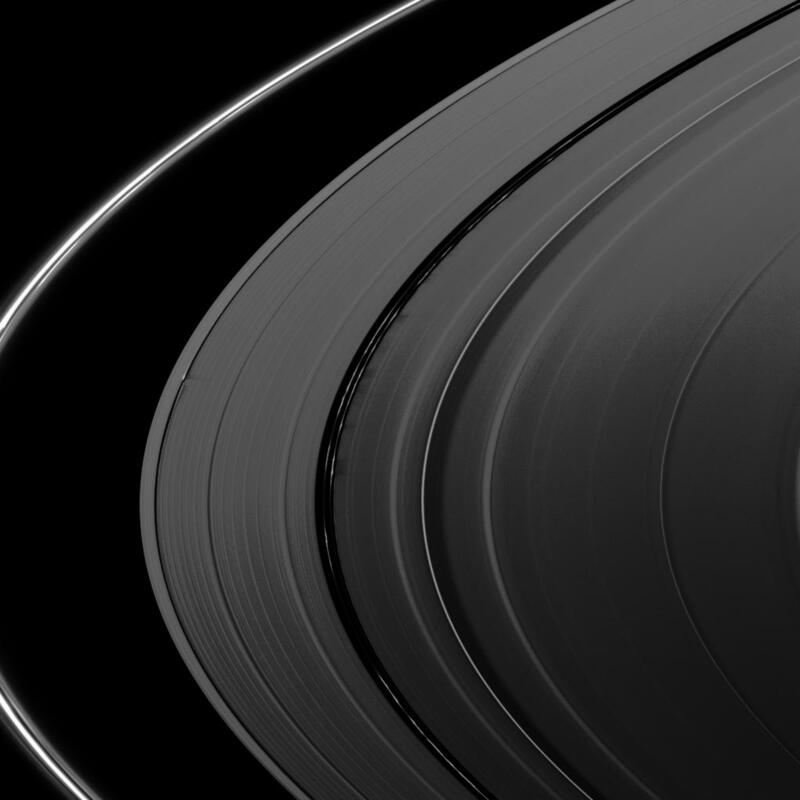 This effect was most pronounced during Saturn’s spring equinox in August 2009 when sunlight was striking the rings edge-on, creating strong shadows from any areas of relief. Imagine the impressive view you’d have if you were nearby, positioned just above the rings as Daphnis approached and hurtled past, the rings rising up in mile-high peaks from the moon’s gravity before smoothing out again. Incredible! And I’m not the only one to imagine such a scene either — apparently artist Erik Svensson is also intrigued by Daphnis, enough to have been inspired to create the image below. How very cool! Like its larger shepherd moon sister Prometheus, Daphnis may be little but still has a big effect on the icy stuff that makes up Saturn’s iconic rings.